Together Greg and Matt have over 15 years of experience dealing and selling authentic autographs. 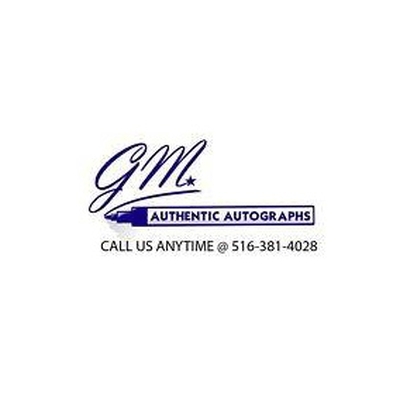 They obtain each individual autograph in person and provide a detailed description of where the item was signed on a GMAA Certificate of Authenticity. Unlike most of the items that tend to hit eBay today, we make sure that each and every item that we offer was obtained in person, by us. While most of the autographs in our inventory are obtained in New York City, GMAA also travels to select film festivals and conventions from time to time. While only some of our items come with “proof” pictures (that is, a photo of the person signing the item), we offer a money back guarantee that EVERY one of our items is 100% Authentic. There are many fake items on eBay, and few sellers who are as passionate about obtaining their autographs in person as we are. GMAA prides itself on fast shipping, excellent communication, and top-of-the-line customer satisfaction. We have over 2,000 items in inventory on eBay, and dozens more that have not been listed. It is therefore extremely likely that if you are interested in an item that you do not see here, we still may have it in stock or could obtain it in the near future. Also, please use our search feature to browse our other items. Our goal is to make our customers feel as comfortable as possible when purchasing autographs. We are aware that many buyers feel a sense of doubt when purchasing autographs on eBay, therefore we do all that is possible to make buyers feel protected such as including "proof shots” and in certain circumstances "exact proof shots." This is to ensure that our customers feel as though they are getting a truly authentic piece—and with GMAA, there is no doubt that you are. We offer a guarantee that our autographs will pass a third party authentication test at AutographCOA (ACOA) or Beckett Authentication, or the customer will receive a 100% refund. Please contact us ahead of purchase to request this service. We are happy to submit any of our items for you, for free, with a 4-6 week added turnaround time. I did a deal with Matt last summer and at the time I did not know how to leave feedback on here, so, better late than never! Matt was very responsive and kind and willing to address the comcerns and my budget at the time. I would definitely do business with them again! Matt. What can I say about Matt?! The man is stellar. I swear every time my phone dings it’s him getting me another graph. He’s always working on posters for me, and he’s finished some amazing ones. I keep saying I’m going to cut back..what can I do with 75 full size posters? But Matt keeps delivering and I keep sending him blank ones. He’s helped me almost finish a dream project, A league of their own poster and I keep telling him he can get me Madonna lol. He stands out in the freezing cold to get a graph he knows I really want. He makes sure everything is in great shape and I’m not sure how, but he always gets the celeb to sign in a great spot.